The password for the files for the Summer School is announced in the welcome session. A list of files is available on a separate page. The design of energy systems that can cope with the intermittency of renewable energy sources as well as the lack of flexibility of demand is a crucial societal concern. Recently, several new technologies, such as power-to-heat systems and electrical vehicles, have become ubiquitous, making energy system design even more complex. The new discipline of Energy Informatics (EI) plays a central role in providing a scientific basis for the design of complex energy systems. In addition to exploring technologies for reducing the overall energy demand, it addresses (1) providing a higher extent of consumer flexibility so that more sustainable and locally generated energy is used, (2) increasing the resilience of energy generation and (3) improving the efficiency of new energy systems. It also provides methodologies and technologies to extract and manage information from energy systems. Furthermore, it offers communication and information-processing principles to operate energy systems securely. The Summer School entitled “Communication Technology and Data Analytics for Future Energy Systems” focuses on providing a strong foundation in the principles of Energy Informatics, with a focus on communication technology, data management, and analytics. The summer school will be a venue for graduate students, researchers and practitioners to learn about and contribute to this field. The summer school is a joint event of the section „Energy Informatics“ within the German Informatics Society (Gesellschaft für Informatik) and the DFG Research Training Group “Energy Status Data – Informatics Methods for its Collection, Analysis and Exploitation” at Karlsruhe Institute of Technology (KIT). Leading researchers in the field of Energy Informatics will give an end-to-end perspective on both the fundamentals as well as advanced topics of communication technology, data management and analytics. The summer school is co-organized by the Chair of Computer Networks and Computer Communications led by Professor Hermann de Meer, where the main contact person is Dr. Robert Basmadjian. The chair's research focuses (amongst others) on the topics of energy efficient systems and communication systems. Registration for the summer school is closed. The schedule is also available as PDF. A detailed description of the talks and workshops can be found in the event booklet. 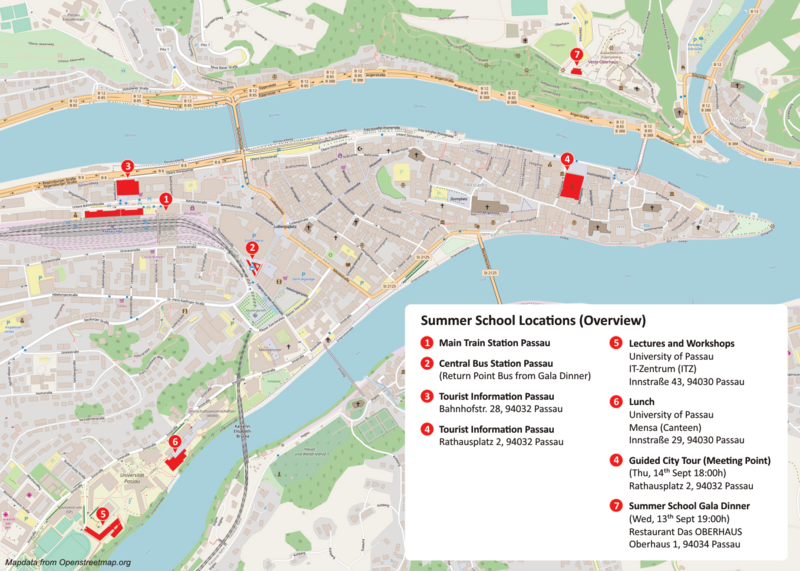 A map of the Summer School Locations is available as PDF. 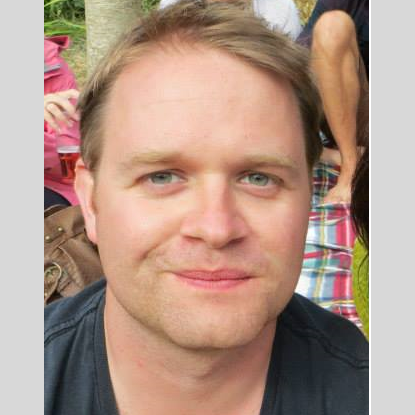 Tom Brown completed his BA and MMath in mathematics at the University of Cambridge in 2004 and 2005 respectively. 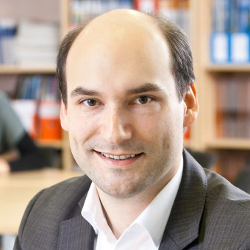 After a PhD in physics at Queen Mary, University of London in 2009, he continued his physics research as a Postdoctoral Researcher at DESY, Germany. In 2012 he switched fields to work on power systems at consultancy firm Energynautics GmbH, and since 2015 he has been working as a Postdoctoral Researcher on the grid integration of renewable energy at the Frankfurt Institute for Advanced Studies. 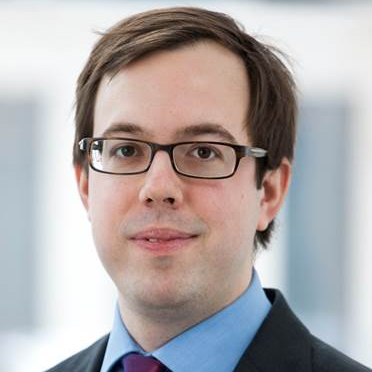 His research focuses on system planning for high shares of renewables, including the requirements for the expansion of the transmission grid, flexibility options and coupling to other energy sectors such as transport and heating. He is an advocate of open data and software in the energy modelling community and is one of the lead developers of the widely-used free software tool Python for Power System Analysis (PyPSA) (https://pypsa.org/). Stephen Haben is a post-doctoral research associate in the Mathematical Institute at the University of Oxford. He is also a member of the Oxford Centre for Industrial and Applied Mathematics (OCIAM). Since 2014 he has been an active member of the Industrially Focused Mathematical Modelling (InFoMM) CDT. After completing his undergraduate mathematics degree at the University of Warwick in 2006 he completed a master in modern applications of mathematics at the University of Bath in 2007. In 2011 he achieved his PhD in the conditioning and preconditioning of variational data assimilation problem at the University of Reading before moving to the University of Oxford later in 2013. His most recent work was as the academic project manager and lead researcher on the £30M low carbon network fund project the “Thames Valley Vision”. On the project, Dr Haben investigated forecasting and mathematical analytical methods for low voltage network demand data for use in a number of applications including scenario forecasting, battery storage control and modelling with limited data. Since 2012 he has been the co-organiser of 4 low voltage demand workshops which focus on forecasting, control and analytical methods applied to low voltage network demand data. In 2014 he was on a prize winning team for the Global Energy Forecasting Competition 2014. His interests include forecasting, clustering methods, optimization, data assimilation, kernel density estimation, quantile regression and error measures. Hans-Arno Jacobsen is a professor of Computer Engineering and Computer Science and directs the activities of the Application and Middleware Systems Research Group. He conducts research at the intersection of distributed systems and data management, with a particular focus on middleware abstractions, (complex) event processing, and cyber-physical systems. After studying and completing his Ph.D. in Germany, France, and the U.S., he engaged in post-doctoral research at INRIA near Paris, before moving to the University of Toronto in 2001. In 2011, he was awarded the Alexander von Humboldt-Professorship to engage in research at TUM in Germany on "Energy Informatics." Professor S. Keshav received a B.Tech in Computer Science and Engineering from IIT Delhi in 1986 and a Ph.D. in Computer Science from the University of California, Berkeley in 1991. He was subsequently a researcher at AT&T Bell Laboratories and, from 1996 to 1999, an Associate Professor at Cornell University. 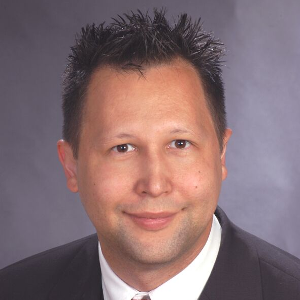 In 1999 he left academia to co-found Ensim Corporation and GreenBorder Technologies Inc. 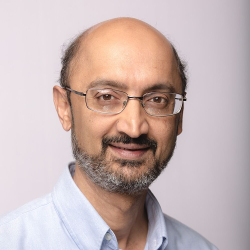 He was an Associate Professor at the University of Waterloo from 2003 to 2008 and has been a Professor since, holding a Canada Research Chair (2004-14) and the Cisco Chair in Smart Grid (2012-17). An awardee of the Director's Gold Medal from IIT Delhi, the Sakrison Prize from UC Berkeley, two Test of Time awards from ACM SIGCOMM, and Best Paper awards at both ACM SIGCOMM and ACM MOBICOM, he is the co-director of the Information Systems and Science for Energy Laboratory, author of two graduate textbooks on computer networking, an Alfred P. Sloan Fellow, an ACM Fellow, and currently Chair of ACM SIGCOMM. Dipl.-Ing. Dr. techn. 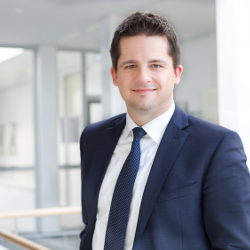 Friederich Kupzog holds a Diploma Engineer degree of electrical engineering and information technology from RWTH Aachen. In 2006, he joined the Institute of Computer Technology at TU Wien, Austria, where he achieved his PhD Degree in 2008. Until 2012, he stayed at the university as Post-Doc and built up the research group ”Energy & IT“ at the Institute of Computer Technology. Since 2012, Dr. Kupzog is Senior Scientist at the AIT Austrian Institute of Technology GmbH. His research interest lies in verification methods for networked Smart Grid systems. He coordinates the research field ”Power System Digitalisation“ within AIT, consisting of research projects together with industry, power grid operators and other partners. Dr. Kupzog holds lectures in Smart Grid related topics at Vienna University of Technolgy and other universities and is active in national (ComForEn) and international (IEEE IECON, IEEE/CIGRE EDST, D-A-CH Energieinformatik) scientific conference organisation. He was awarded the Austrian Smart Grid Pioneer Award together with his colleagues in 2010 and 2012. 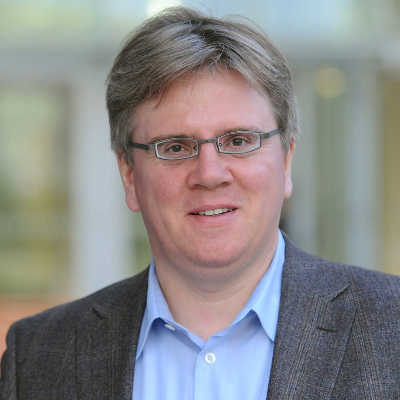 Sebastian Lehnhoff is a Full Professor for Energy Informatics at the University of Oldenburg. He received his doctorate at the TU Dortmund University in 2009. Prof. Lehnhoff is a member of the executive board of the OFFIS Institute for Information Technology and speaker of its Energy R&D division. He is speaker of the section “Energy Informatics” within the German Informatics Society (GI), assoc. editor of the IEEE Computer Society’s Computing and Smart Grid Special Technical Community as well as an active member of numerous committees and working groups focusing on ICT in future Smart Grids. He is an honorary professor of the School of Information Technology and Electrical Engineering at the University of Queensland. 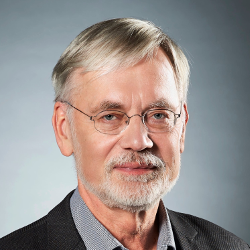 Prof. Lehnhoff is elected chair of the of the IEEE CA4EPI Working Group P2030.4, and chairman of the architecture and quality committee of the openKONSEQUENZ industry consortium for the development of open source software in power system operation. Prof. Lehnhoff is author of over 100 refereed and peer-reviewed scientific publications. Open communication standards and data models to ensure the interoperability of IT-architectures. Real-time methods for automating the distribution network to enable distributed plants at lower voltage levels to provide ancillary services. Distributed algorithms for decentralized resource planning within distribution networks to increase flexibility. Methods and tools to assess and support changing ICT-corporate architectures of energy supply protagonists. Methods for simulation and automated analysis of large-scale integrated multi-domain energy systems. Hartmut Schmeck studied at the Universities of Kiel (Germany) and Waterloo (Canada). He got his academic degrees (Dipl. Inform., Dr.rer.nat., Dr. habil) at Kiel. Since 1991 he is a Full Professor of Applied Informatics at the Karlsruhe Institute of Technology - KIT. He is (co-)author of more than 200 publications on advanced algorithms and architectures, in particular on nature-inspired methods in optimisation, algorithms for reconfigurable architectures, and, more recently, on self-organising, adaptive systems applied to energy and traffic systems. He has been program and conference chair for numerous international workshops and conferences and coordinator of the German priority research program SPP 1183 on “Organic Computing”. As a principal investigator of several cooperative projects in various funding programmes he is pushing the development of intelligent systems in tomorrow's energy systems and for electric mobility, shaping the new discipline of “Energy Informatics”, in particular as a director of the FZI Research Center for Information Technology. Anke Weidlich is a professor for Technologies of Energy Distribution at the University of Freiburg. Before, she was a professor for Energy Economics and Energy Systems Technology at the University of Applied Sciences in Offenburg from 2011 until 2017. 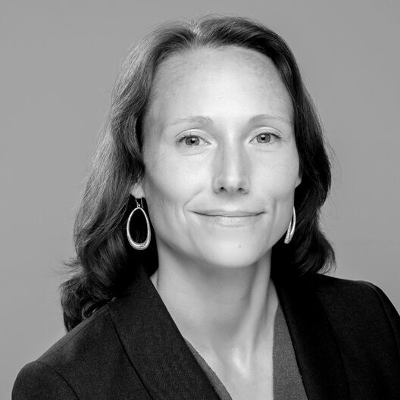 Ms. Weidlich gained industry experience as a senior researcher and project leader in the domain of Smart Grids at SAP AG (today: SAP SE). Prof. Weidlich studied Industrial Engineering and Business and then pursued advanced studies in Energy Economics and Energy Policy in Paris. She pursued PhD studies at the University of Karlsruhe (today: Karlsruhe Institute for Technology KIT), with stays in the USA and in Mannheim. Christian Hinrichs graduated in computer sciences at the Carl von Ossietzky University of Oldenburg, Germany, before working as research associate in the Dept. of Environmental Informatics. His research focused on self-organized coordination and distributed heuristics in the domain of energy systems. After receiving his doctorate in 2014, he continued working in a postdoctoral position for another two years. Since 2016, he is employed as Senior Consultant by BTC Business Technology Consulting AG, Germany, occupying the roles Data Scientist and Analytics Architect. A significant part of his work focuses on building cloud-based big data platforms for advanced analytics and smart data services. Klemens Böhm is full professor (chair of databases and information systems) at the Karlsruhe Institute of Technology (KIT), Germany, since 2004. Prior to that, he has been professor of applied informatics/data and knowledge engineering at University of Magdeburg, Germany, senior research assistant at ETH Zürich, Switzerland, and research assistant at GMD – Forschungszentrum Informationstechnik GmbH, Darmstadt, Germany. Current research topics at his chair are knowledge discovery and data mining in big data, data privacy and workflow management. Klemens gives much attention to collaborations with other scientific disciplines and with industry. He is the speaker of the DFG research training program 2153 "Energy Status Data – Informatics Methods for its Collection, Analysis, and Exploitation" at KIT. Dirk Neumann holds the Chair of Information Systems of the University of Freiburg, Germany. 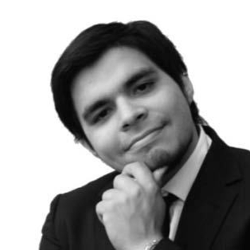 His research topics include business analytics, text mining and optimization. He studied information systems in Giessen (Diploma) and Economics in Milwaukee, U.S. (Master) and earned a Ph.D. from Karlsruhe Institute of Technology in 2004. Display bigger map © OpenStreetMap. Passau is a city located in Lower Bavaria, Germany next to the border to Austria at the meeting point of the rivers Danube, Inn and Ilz. 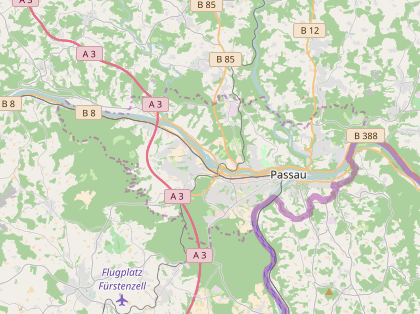 The University of Passau has around 12,000 students and doctoral researchers. The Faculty of Computer Science and Mathematics has 18 professors and encompasses 4 institutes with focuses ranging from theoretical computer science and software engineering to information systems, IT Security and technical applications of computer science (computer engineering). The summer school is co-organized by the Chair of Computer Networks and Computer Communications led by Professor Hermann de Meer. The chair's research focuses (amongst others) on the topics of energy efficient systems and communication systems. The German Informatics Society (GI) is the largest German-speaking non-profit association for computer science. It is comprised of computer scientists from both academia as well as industry and is involved in the formal education in schools and universities. The GI provides possibilities for knowledge exchange and collaboration amongst peers and furthers computer science education. The members are structured in regional groups (“Regionalgruppen”) and topically into technical groups with focuses ranging from Computer Science Foundations to Databases and Information Systems, Communication Systems, and Software Engineering. Research Training Group "Energy Status Data – Informatics Methods for its Collection, Analysis and Exploitation"
The research-training group is funded by the German National Science Foundation (DFG) with funds from the Federal Government and the German states. It has started on May 1st 2016 and has a duration of 4.5 years. An essential aspect is the consumption of energy, particularly of complex systems such as factories or IT infrastructures. Important points are the flexibilization of energy consumption, so that the share of locally generated 'green' energy increases, robustness of energy provisioning, or the efficient design of new energy systems serving these purposes. To accomplish this, a core prerequisite is a structured collection, storage and analysis of energy status data. Energy status data describes the provisioning of energy, its storage, transmission and consumption, be it the outcomes of measurements, be it metadata such as the extent of fatigue of batteries, be it other relevant data such as electricity rates. This Research Training Group targets at the handling of energy-status data. To this end, an interdisciplinary approach (computer science, engineering, economics, law) is indispensable. It reveals new scientific challenges our Ph.D. students are confronted with as part of their education. For instance, we have observed that different planning and control purposes require data of different temporal resolution and at different aggregation levels. This varying granularity leads to the question how to find outliers in such data at the right level of abstraction. Other graduates benefit from new approaches that detect such outliers. They can now work more efficiently, e.g., can identify shortcomings of existing models of energy systems systematically. An example of such a model would be one describing the behavior of Li-Ion batteries. The infrastructure for energy research of the KIT Helmholtz sector such as the EnergyLab 2.0 will be subject/object of the Research Training Group to a significant extent; the persons responsible for these facilities are part of the principal investigators of this Research Training Group.